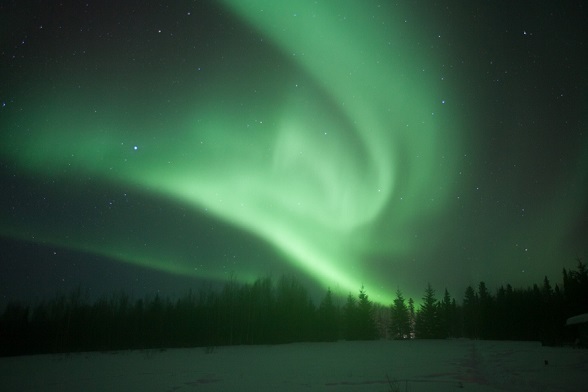 We have conducted many trips primarily to Alaska and Scandanavia to view the aurora. One thing we have found is that if you are planning to observe from a particular hotel or lodge, certain practices need to be exercised by the hotel or lodge in order to ensure that your experience is going to be positive. In addition, below we provide a number of tips that will help you get ahead of the game before you take your first aurora photo. 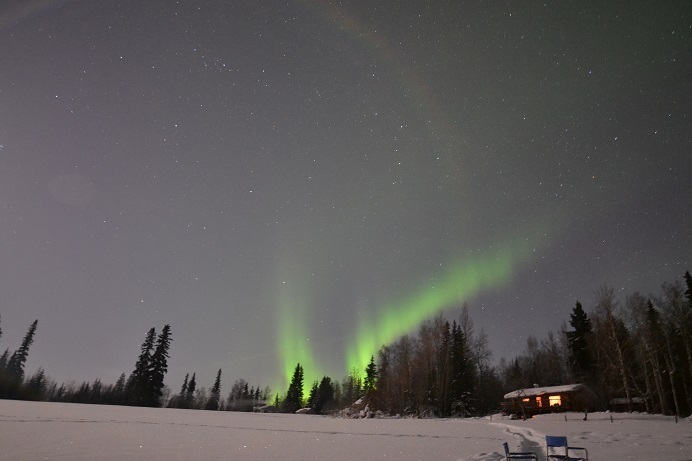 Generally there is little to no wind in Fairbanks during aurora viewing months. This is great because it means you have little to worry about from wind chill. However, it does get cold. Temperatures at night can dip to -20 deg F but usually are higher than that. You should prepare clothing for worst case conditions and layer so you can add/remove layers to assist with your comfort. If you are arriving early and overnighting in Fairbanks prior to being transported to the lodge, we suggest that you wake a 2 block walk to Big Ray’s at 507 2nd Avenue provided you are staying at the Springhill Suites. They have beyond a doubt the largest selection of winter clothing we have ever seen. If you cannot find what you want there, it may not exist. Prices are reasonable too. Hand warmers, toe warmers: put those in pockets or shoes to keep hands/feet warm. They are disposable and will generally work for 5 to 7 hours. Parka: consider a parka rated to -20 deg F or even colder. Remember you will likely be sitting/standing for a considerable time and the longer you remain in one position, the colder you will get. You should have well nested interior pockets and exterior zippered pockets for putting key items for photography, flashlight, etc. 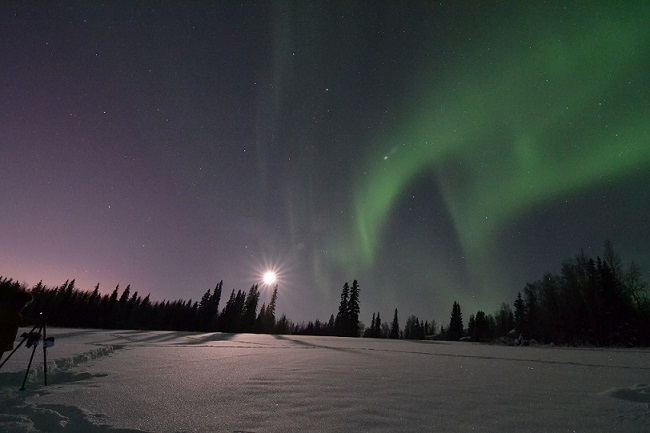 a. though we normally schedule our expeditions around New Moon, even if the sky is perfectly clear, it is possible NOT to see aurora if there is no solar activity to kick off a disturbance in the Earth’s magnetic field. 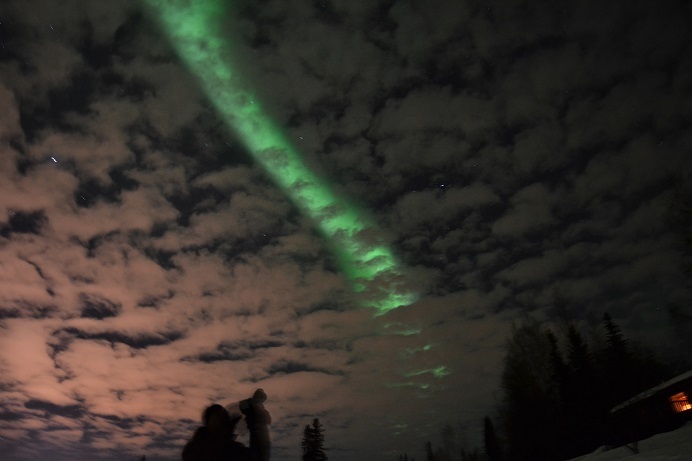 b. when there is aurora activity, it can often be seen if the sky is partly cloudy and on some occasions can light up the cloud even if the sky IS cloudy. 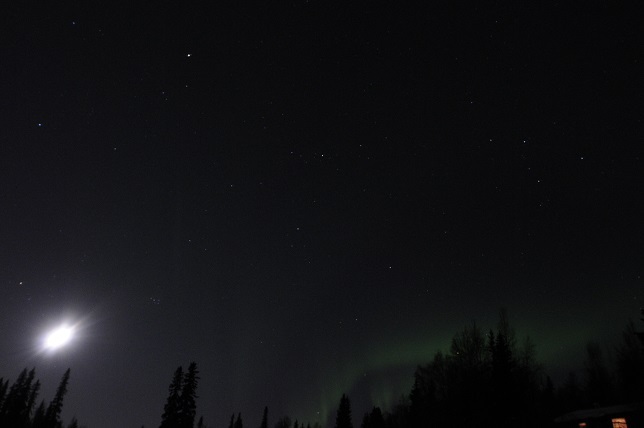 c. aurora can also be seen even with the Full Moon. d. aurora can be impossible or extremely difficult to see (much less photograph) if inside a well lit city. e. weather forecasts and solar activity forecasts, regardless of the source, should be taken with a grain of salt. f. aurora photography with a point and shoot camera is generally useless and will irritate those around you if your flash goes off. We do not allow flash cameras at our (exclusive) observation venues. g. when you see your first really good auroral display it will be a thrill of a lifetime. h. do not be deterred by the cold or even by the presence of cloud. Be persistent. If you have multiple nights, check every hour or two when it is overcast. In northern climates, skies an often become clear or partly cloudy for a short time or for very long periods without warning. The above photo looks terrible. In reality there is plenty of cloud but three indications of aurora. The bright green glow behind the trees indicates something is happening low on the horizon to the north. That glow might be mistaken for car headlights. 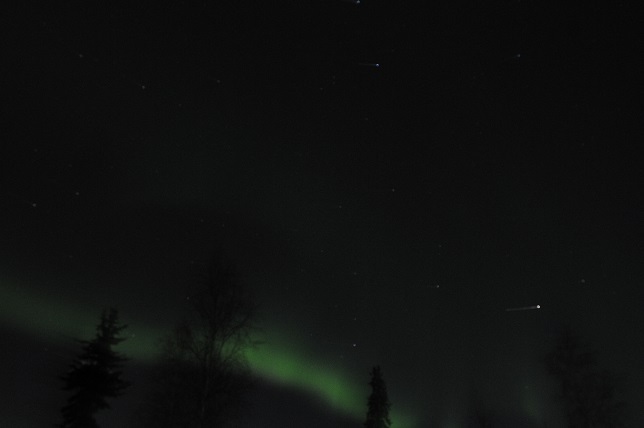 In the far right side of the photo, there is a faint green auroral glow. Then to the left of the cloud there is a very faint light green aurora glow. Visually you might not recognize these indicators, especially if you just stepped outside and your first conclusion was that it was mostly cloudy. i. Aurora can appear for a few seconds to minutes in one area and then vanish. It can become intense in a matter of seconds (or not). It can move around the sky or remain entire stationary on a time scale of seconds to minutes or even longer. j. a sign of minimal activity may be a faint green static arc that lasts for a significant period of time but does not change in intensity. k. the appearance of extremely intense aurora have, on extremely rare occasion, been linked to sounds heard by a few observers. I have not met anyone who has experienced this phenomenon. l. aurora can appear white, green, red and even blue though the most common visual color is green. m. the camera can always record more than the eye but the visual experience can be extraordinary. n. aurora can take on the appearance of a slow or rapidly moving set of piano keys or an accordion, essentially a curtain with well defined linear structures. 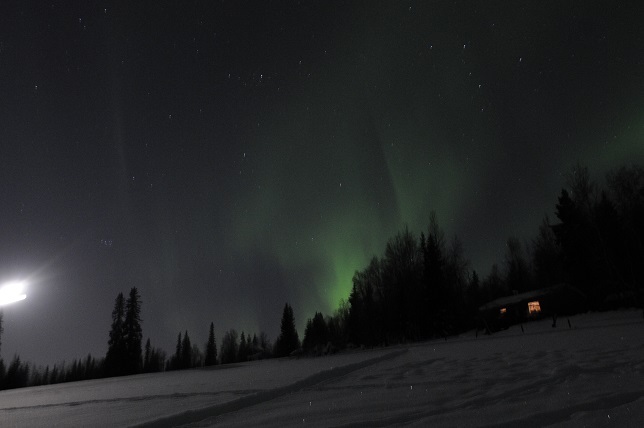 o. someone may tell you that aurora can only be seen during certain hours, for example between 1030pm and 230am. Look any time the sky is dark. You never know what will happen. Be patient and persistent! p. aurora can likely be expected within 2 days after a very stron solar flare has been initiated. 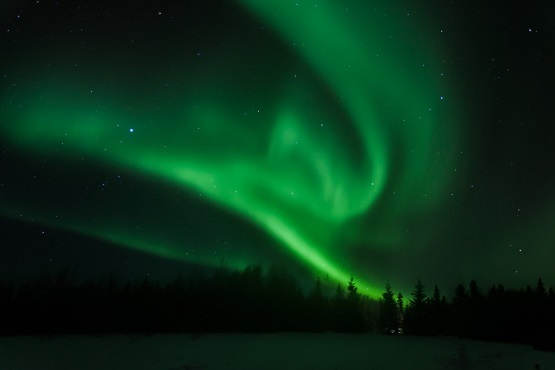 Sometimes the effects of that stream of high energy particles can linger for several days causing light to moderate auroras or even strong auroras to be seen. First indication of aurora activity. P. Maley photo. 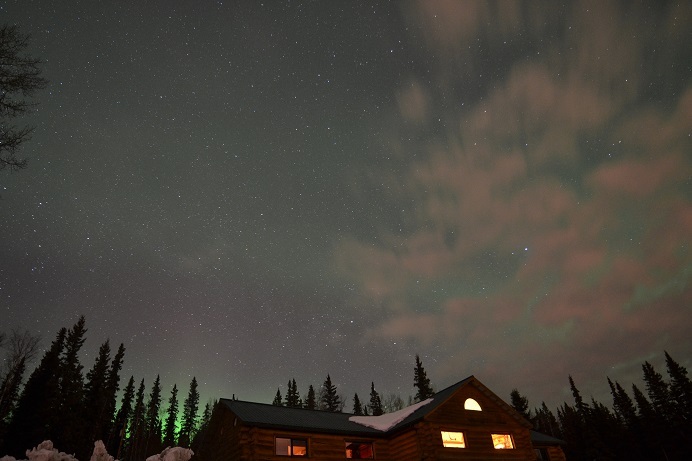 By far, we have found that lodges in Fairbanks DO NOT follow the guidelines listed here. Even so, you might find that going to nearby lodges are your best bet. If you are purist, this means that if you want to avoid interference to aurora photography, you should consider to get far away from the very places that are supposed to have your best interests in mind. In the end, it may mean renting a vehicle and driving to some uninhabited road or view point rather than waiting at a place that is advertised to be warm, have comfortable facilities, etc. 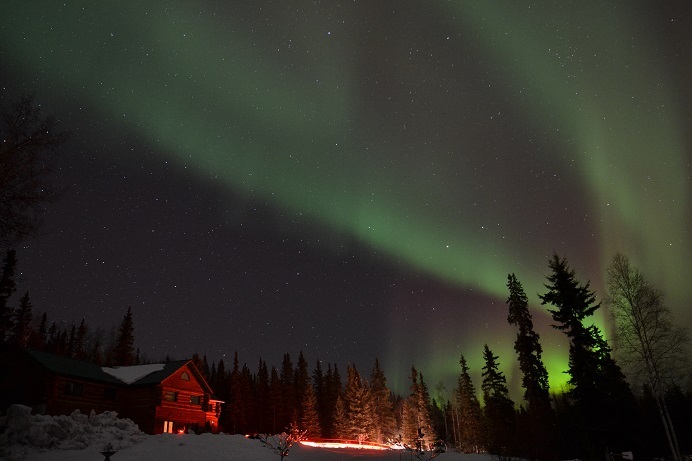 Because aurora photography is generally the primary goal of serious aurora observers and involve time exposures from 5 to 30 seconds or longer, CHECK TO SEE IF YOUR HOTEL OR LODGE DOES THESE THINGS! If they do not, you will need to cope with these potential issues. 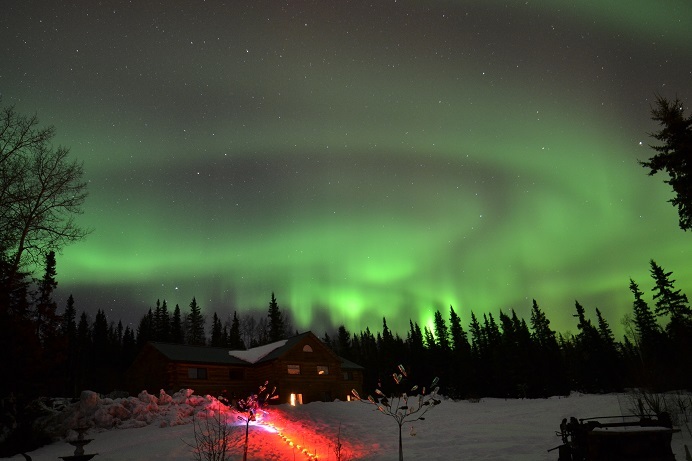 Aurora curtains are one of the exciting outcomes of a successful night of viewing. P. Maley photo. ISO800, 30 seconds exposure, 14mm f/2.8. 1. limits the number of guests so that you are not competing with 50 or even as many as 150 other aurora viewers. If this is not the case, consider to avoid this venue. 2. has posted signs for arriving vehicles to TURN OFF THEIR LIGHTS AFTER 10PM. The hours between 10pm and 230am are roughly (but not always) the major time period for auroral activity. Photo above shows car lights that moved quickly through the frame but not directed at the camera. This is a mild form of light pollution. P. Maley photo. Another example where car lights glisten off snow in front of the camera. P. Maley photo. 3. blocks building windows to ensure white light does not spill out around the venue limiting where you can set up your camera. Lights on in a lodge room (left side). P. Maley photo. 5. bans use of white lights of any kind after 10pm and enforces a red light only policy. 6. during winter time, grades potential snow trip hazards. This is a potentially serious problem and we have been at Fairbanks locations where guests have fallen / become injured, have dropped items in the snow or damaged equipment through a trip / fall. 8. bans the use of flash attachments on cameras. 9. caution room residents who are staying at the venue to turn off their room lights after 10pm and not to shine white lights out the room windows. 10. OPTIONAL: vendors should consider providing snowshoes so serious photographers can venture far away from the main viewing area to get away from interference. 11. At lodges it is not uncommon to have non English speaking guests. Be aware that they may not know the proper aurora viewing protocol and do things like walk in front of your camera or use white flash lights. 0…No activity at all. Stars visible. 1…White aurora patches looking like faint cirrus clouds. If you take a time exposure they will appear light green in color. If the photo does not show green in color then you are seeing cirrus clouds. 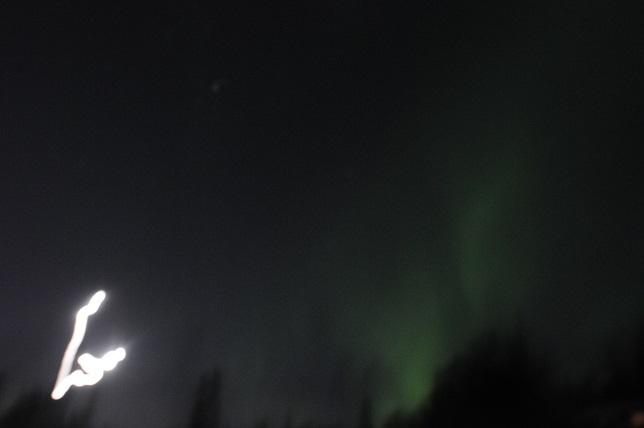 2…Large green arcs usually starting low on the north horizon. Faint in intensity. Arcs do not move much if at all, then fading out. 4…Green arcs/bands slowly changing form; one or more bands may stretch from horizon to horizon. 5…Green areas varying in size, intensity and form on a time scale of a number of seconds. Some other shapes such as curtains, streaks or irregular patches accompany them. 7…Curtains shimmering in a rapid time sequence on the order of seconds. Bands, rays, streaks of different sizes/intensities moving or relatively stationary at times. Forms popping up in one place, then in a different place or reappearing with varying intensity. Some forms become huge and expansive. 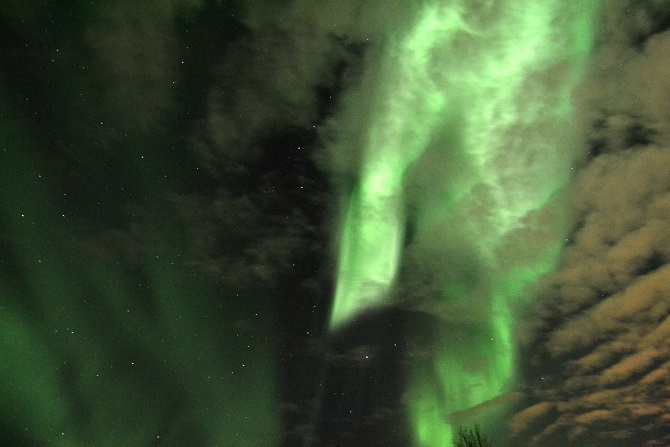 8…Intense coronal features at the zenith with variable intensity features in many parts of the sky. You will need to reduce ISO or exposure time to avoid overexposure and saturation. 9…Red, green, purple, white extremely intense aurora capable of lighting up the ground. Rapid time scale changes. 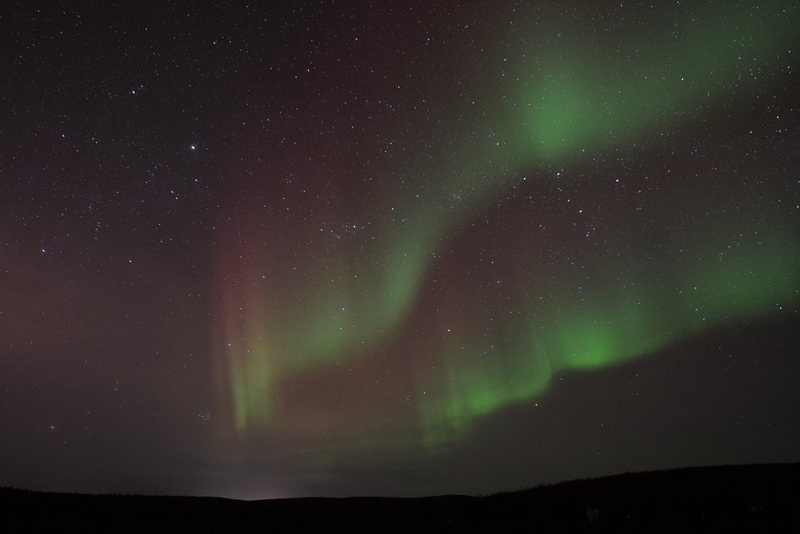 After high levels of aurora activity that cover the entire sky, the sky itself may take on a dull gray overcast appearance signifying the end of a major auroral episode. When at a venue where other people are present you should be aware of what your actions will do to others and vice versa. In addition, before you even embark on an aurora photography adventure, consider some of the following tips. 1. When using a white or red flashlight, point it down at all times. Light of any kind, even red light, can interfere with night vision, be distracting, and impact photography. On nights when the Moon is present, walking on snow may be fairly easy to do without a flash light. Even a red light can be a distraction in an otherwise good auroral image. P. Maley photo. 2. Disable the ability of your camera to flash. Cover or tape the flash to back this up. 3. Be aware that the screen on the back of your digital camera (and tablets or IPADS) is a white flash light and can interfere with other people’s photography and your own dark adaptation. Many photographers take a single shot, the buffer stores it, then the screen illuminates. Usually these screen projections cannot be avoided as it is the only way to confirm that a photograph has been successfully taken and the camera is pointing in the correct direction. Alternatively, other photographers use a camera feature to turn off the back screen, then use a separate button to display the image on request. This allows an initial assessment of focus and the camera to be left in place without moving the field of view to take consecutive exposures. 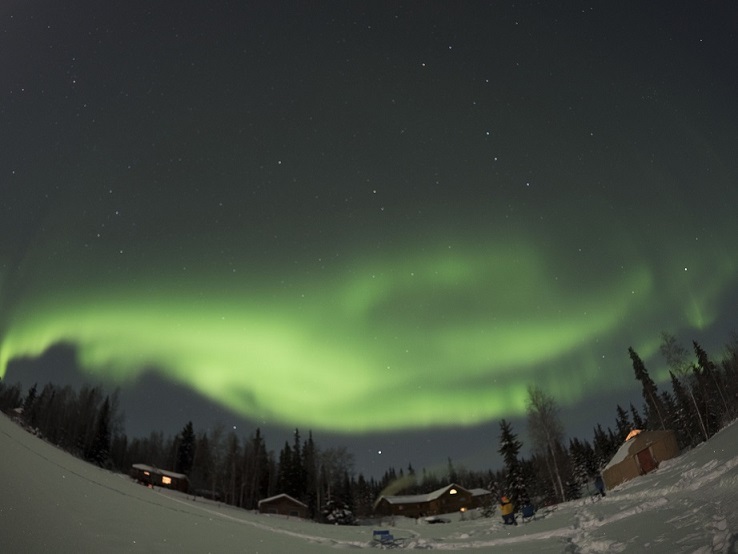 A single exposure can then be used the next time the camera is moved to a new position or it is necessary to check the exposure if the aurora brightens or dims. Some cameras have a setting to dim the back screen. If you have such an option it may appear in a menu called “MONITOR BRIGHTNESS”. If you have it, please set to its lowest usable setting. 3a. Many SLRs have a small light on the back next to the screen that turns on when the image is being written to storage. This light is an additional pollutant. If your camera operates properly, when the light goes off the image will appear on the back screen. Place tape over this light if you do not need it as a visual indicator. 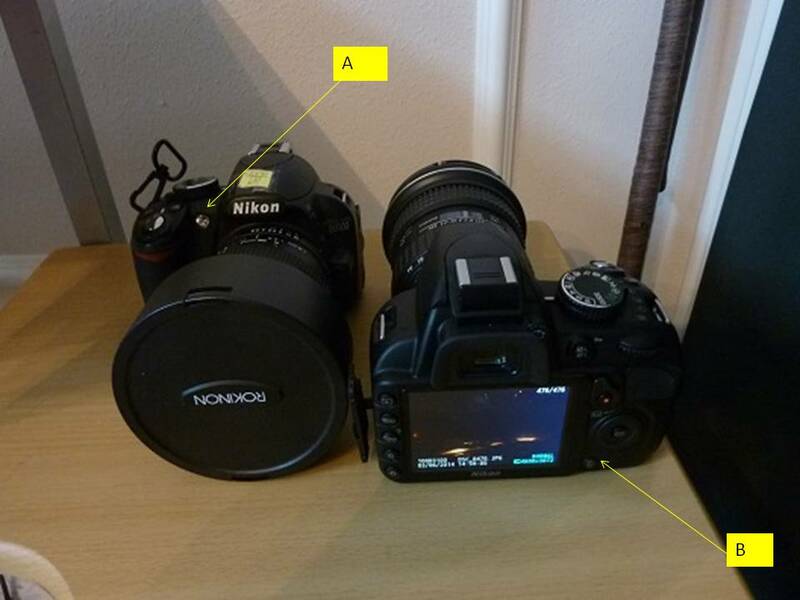 In the Nikon D3100 camera image above, “A” identifies the auto-focus assist illuminator light (see item 50 below). “B” shows the location on this camera where the tiny buffer writing light may be situated, while the back screen is clearly visible. P. Maley photo. 4. If you see another person has a visible camera screen in front of you, either point your camera so the bottom of the field of view is located ABOVE that person or move to another location where there is nobody in front of you. 5. When anchoring your tripod in snow be sure all knobs are tight on the tripod and on the camera attach point. When off the beaten path on semi-soft snow make sure the tripods legs have a secure footing. If one of the legs breaks through the crust, the whole rig could topple. 6. Be careful not to wall too close to anyone’s tripod or in front of someone taking a photo. 7. Set up as far from others as is safe and possible. 8. Temperature affects battery life. Keep at least one spare fully charged battery snug in a coat pocket. 9. In cold weather weather your feet will eventually become cold; wear two pairs of socks and keep your feet moving when standing in sub freezing weather. CONSIDER ELECTRIC SOCKS. Chemical hand/foot/toe warmers also work well. 10. BRING A HAIR DRYER IN YOUR LUGGAGE or determine if there is a hair dryer in your lodge room. If your camera has been out in cold temps for a long time, it will fog over when brought into a warm environment. Blast the camera lens and view screen until fog is removed. This is perhaps easier than wrapping your camera in a plastic bag prior to bringing it indoors which will also mitigate fogging. A 2 gallon ziploc bag worked really well. It’s large enough that a sizable camera drops right in and the ziploc is air-tight. 11. If using a shutter release be prepared to have a workaround in case the release jams. You can manually set exposure time and use a heavy glove to block the camera aperture after opening the shutter and before closing the shutter. This will prevent the appearance of double star images. 12. 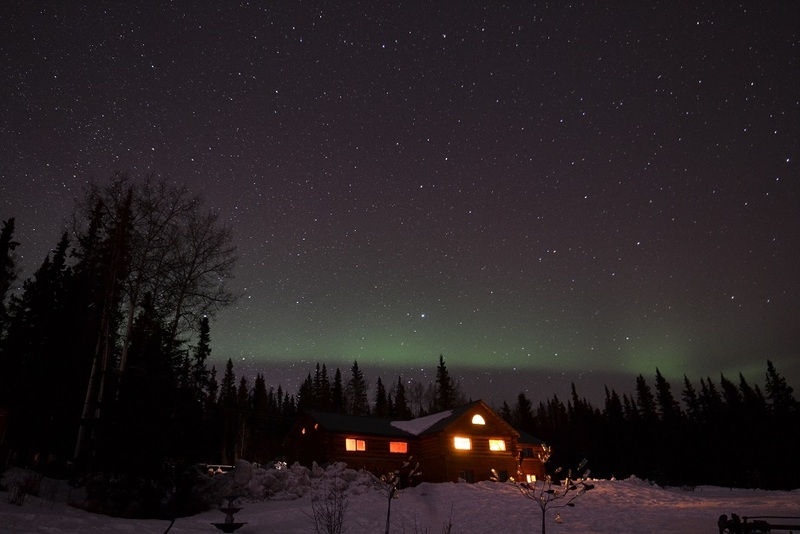 Aurora can occur anywhere in the sky but will be noticeable in low activity conditions. Use test exposures to determine exact focus BEFORE YOU DO ANYTHING ELSE and to assess likeability of resulting images. 13. Your camera will see more than you. Colors on the image will not necessarily reflect what colors your eye perceives. 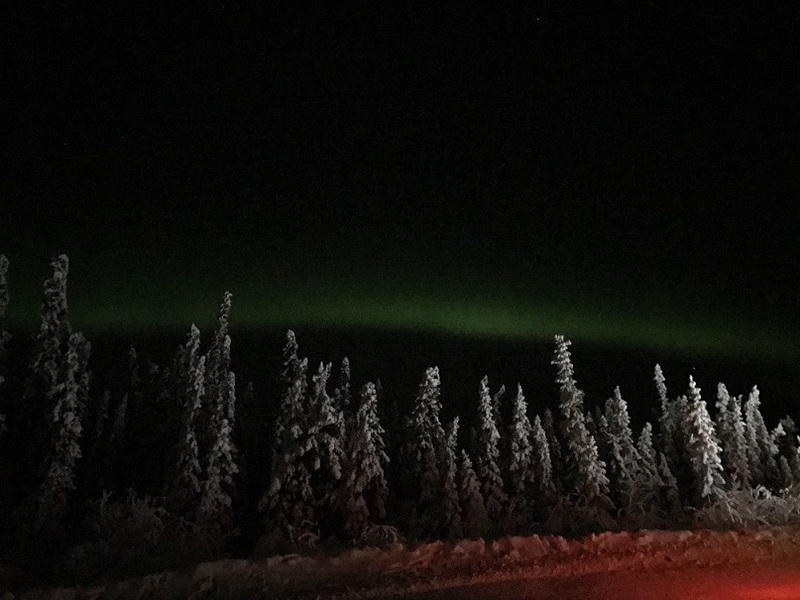 The appearance of “red” in the image may be indicative of ground lights reflecting off suspended water droplets or ice crystals rather than actual red aurora. 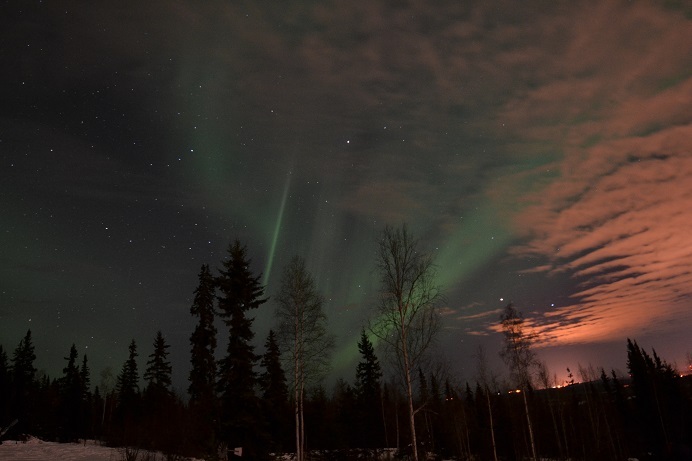 Green aurora are in this image but so is red reflections off clouds from lights at the refinery at North Pole, Alaska. P. Maley photo. 14. Know how to operate your camera before you travel. 15. Always bring your camera operating manual in case you experience an unexpected problem with the camera. If you have a smartphone, tablet or laptop, the manuals can often be downloaded as a pdf file on your device or made available from cloud storage such as google drive or dropbox. 16. If your camera experiences a hard failure and you do not have a backup camera, simply watch visually. DO NOT USE YOUR CAMERA ANY MORE. BINOCULARS ARE OF NO USE TO WATCH AURORA. 17. 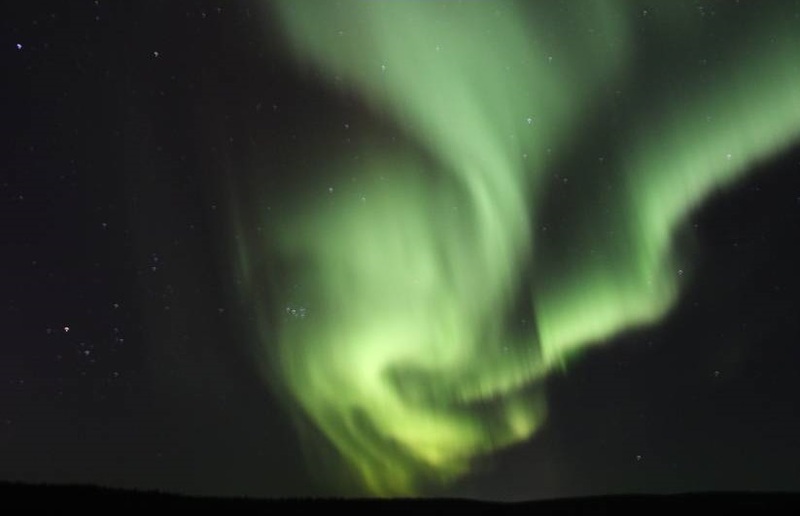 Auroras can occur unexpectedly and do not follow an alert plan. 18. Aurora forecast sites are not always reliable. The same goes for weather forecasting sites especially in Alaska. These should be treated as indicators. Use multiple sites when possible. Do not be discouraged even if cloud is present. Aurora can be seen even with cloud, as can the occasional satellite (right center margin). 19. Knowing the correct aurora exposure is not always possible. Start with ISO 1600 and 20 seconds. 20. Best lens configuration are 10 to 14mm focal length. When a focal length of a lens is recommended it’s usually referenced to its full-frame equivalent. I am assuming that 10-14mm is for an APC-size format. The Nikon full frame equivalent (1.5x) is 15-21mm, and the Canon full frame equivalent (1.6x) is 16-22mm. 21. If you are at a good site, periodically watch your surroundings for interference from cars and people. Animals may also be an issue. If you are not familiar with your site, be alert for potential unexpected trip hazards as you move about in the dark. 22. 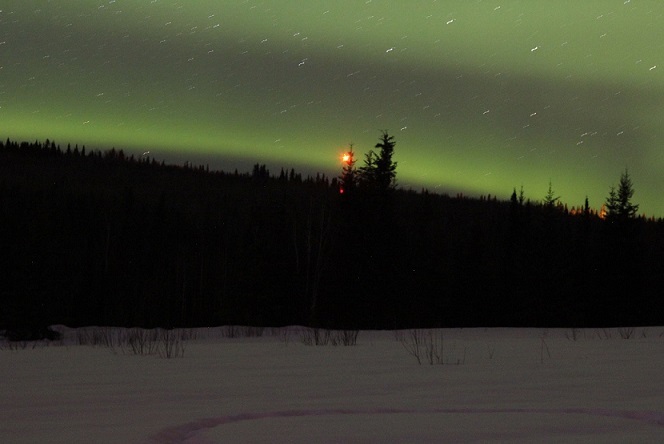 Wear layers so you can remove or add as you go on a new aurora watch each night. 23. If wind is expected, wear a gator or face mask to protect your face in cold conditions. 24. If you wear glasses and are using a face mask, if the glasses are not small in size (that is, they do not cover a large area over your eyes) watch for fogging of your glasses. Fogging of glasses could be a real problem while wearing a balaclava. Anti-fogging solution may not solve the problem. Disposable contacts and cheap reading glasses worn around the neck with a lanyard are one possible workaround. Fogging of the reading glasses may be less of an issue if they are just needed them while adjusting the camera. 25. 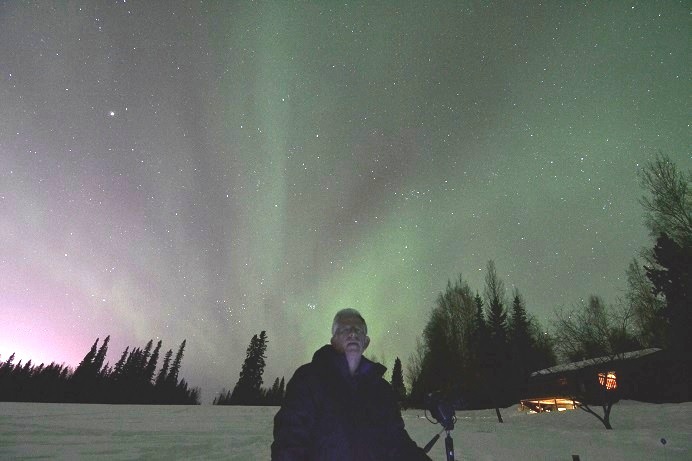 To photograph people against an Aurora background use a red flashlight to paint the subjects while the exposure is in progress, rather than a camera flash. This is a bit of an art and may take more than one try. The writer appears underexposed in this photo without any light painting. L. Palmer photo. 26. Be sure to wear gear when kneeling to photograph to avoid stress on knees when adjusting camera pointing to high elevations. 27. Focus should be verified before any series of exposures is initiated. Once the first night sky shot is taken, use the zoom feature to check for pinpoint star images. Do not adjust focus afterward unless you suspect focus has unexpectedly changed. NOTE THAT THE INFINITY SETTING MAY NOT BE WHERE REAL ‘INFINITY’ IS LOCATED ON THE CAMERA. If you move your camera as a result of any action during the photo session, it is further good idea to tape the focus ring down so it does not move. That should help maintain the focus, particularly if you are forced to move your camera because of human activity or changes in the aurora. 28. Sharing your aurora images is much appreciated by those on the trip who do not have proper photo gear. This giant green snake is an aurora. 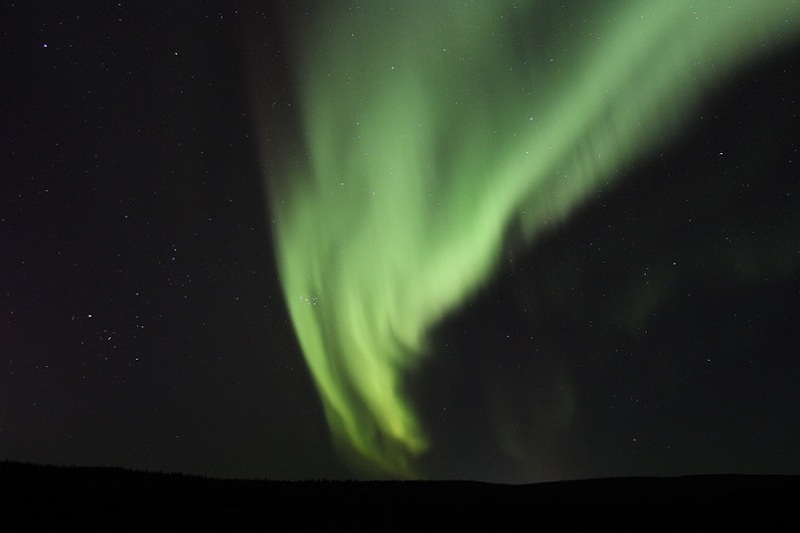 While it may seem that the aurora is actually located in the clouds, the lowest altitude is around 60 miles and the highest visible aurora around 200 miles. P. Maley photo. 29. CONSIDER TO Bring a computer device and download cable in order to evaluate the results of each night’s images. Then make whatever changes are needed in order to improve the results for successive nights. 30. Use the buddy system if you do not want to stay up all night waiting for aurora to appear. One person should take the first shift while the other person grabs much needed sleep. 31. When walking from one location to another in the dark and in snow, always be sure your lens cap is on the lens. Once set up, keep the lens cap in a known pocket. 32. Pick and choose your photo opportunities. If the aurora is very diffuse–like high cirrus–you should wait until the become more clear and well defined. This is especially true if you are battery power limited. Aurora can take on weird and intense shapes. P. Maley photo. 33. To help maintain camera battery integrity, locate the battery compartment prior to the trip and find a way to secure a hand warmer to it so that some amount of heat is continually applied in cold weather environments. 34. Use common sense when taking aurora pictures. If you do not like your location–move. If you do not like a recommended exposure or ISO setting, CHANGE IT AND SEE WHAT HAPPENS. 35. When possible compose your image so that there is foreground material such as buildings, trees, mountains, animals and people. 36. If there are people IN FRONT OF YOU REGARDLESS OF WHERE YOU GO, unless you want them in the photo BE SURE THE BOTTOM OF YOUR CAMERA FIELD OF VIEW IS ABOVE THE HEADS OF THOSE IN THE FOREGROUND. 37. Be aware of possible movement of your foreground subjects before engaging an exposure. Someone has moved with a camera back screen glowing in the bottom portion of this image. P. Maley photo. 38. For SOME digital SLR cameras, buffering time after each exposure can amount to a 100% increase in time before the next exposure can be started. E.g. a 30 second exposure could mean that 60 seconds elapse between one exposure and the next. IF YOU HAVE A WAY TO PROGRAM YOUR CAMERA TO TAKE AURORA EXPOSURES AUTOMATICALLY, TEST IT BEFORE THE TRIP AND ENSURE THAT IT WORKS. THIS CAN BE VALUABLE IN CREATING A ‘MOVIE’ OF CONSECUTIVE AURORA STILLS. 39. Aurora action time scales can be on the order of seconds to many minutes depending upon the level of activity. Temper your expectations with the reality of what you see. 40. 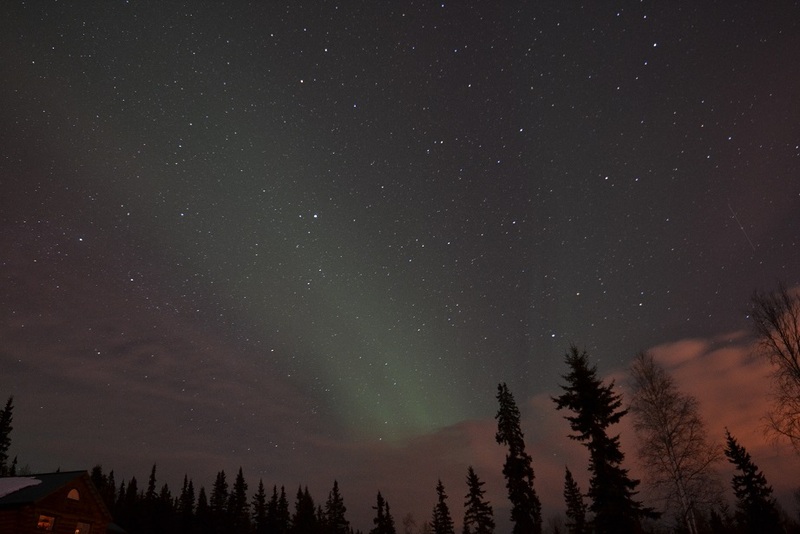 To build a sequence of exposures that might later be stitched into a video to show aurora motion, use the same exposure time and program your camera ahead of time. Leave the camera pointed in the same position throughout this period of time. One hour would be a good interval with which to begin. 41. Shoot in raw format. Shooting in .JPG will contain less resolution. Watch to see how many images are storable in this format as you may need large storage media or carry multiple SD cards, for example. It is possible to store more than1000 RAW images on a 32GB memory card shooting with a 21 megapixel camera. With 32GB memory cards running $20-50 and 3TB hard drives on-sale for $100, increased storage requirements are not a significant limitation. RAW+jpeg is also an option even if the RAW file is not routinely process but just saved as a digital negative. It will then be available when you take a shot of a lifetime that needs a little RAW processing to optimize. 42. Consider to use noise reduction software when downloading your images. 43. Using “Live View” to focus on bright stars can be handy in low light situations but may consume more power than you like. It is not useful to image aurora typically. 44. Always start out by setting your lens to the largest aperture –lowest f number. 45. 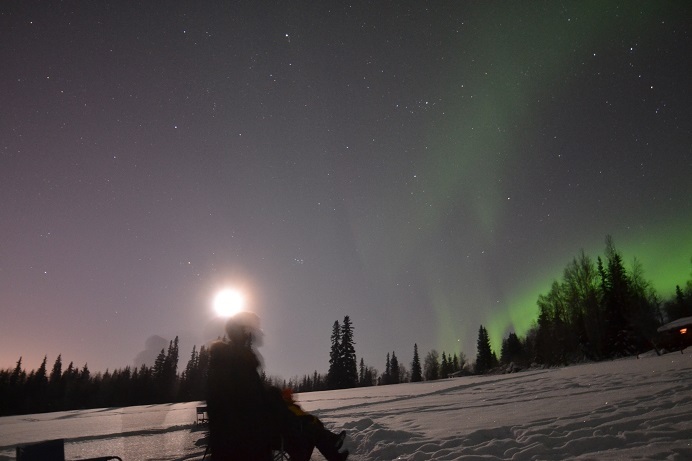 Shooting aurora with even the Full Moon present may not necessarily be a bad thing. If moonlight is present this will perhaps affect your exposure by one or two stops. 46. When testing for proper exposure use the histogram feature. A curve in which everything is concentrated non the left-most 10 to 40% means the subject is too dark. Increase the ISO or set a longer shutter speed. If the histogram shows a wide curve in which a large part is concentrated in the right part and the peak is close to the middle, then the picture is too bright, then decrease the ISO or shorten exposure. An ideally exposed aurora photo shows a curve with a peak in the left side but not pushed against the side and with a tail extending out and fading in the right half of the histogram. The peak in the left side represents all dark parts of the sky in the picture and possibly a dark foreground or landscape. 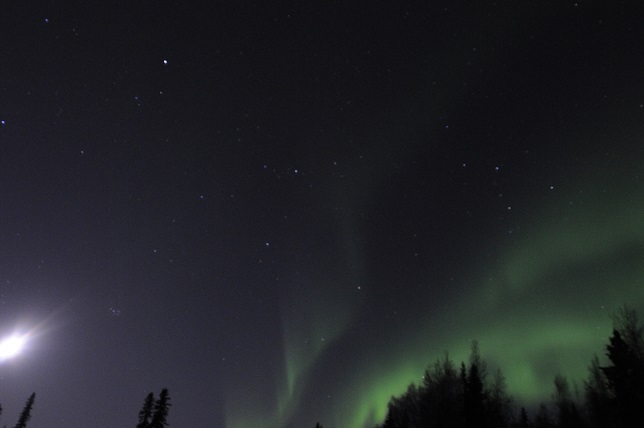 The right part contains the pixels that represent the aurora and stars. Even when photos appear overexposed, if the image histogram shows that brightness levels extend to baseline on its left (dark) and right (bright) sides, the exposure is within the dynamic range of the sensor and at least some shadow and highlight detail are present. If the histogram is blocked up (fails to come to baseline) against the left or right wall of the histogram, shadow detail (left side) or highlight detail (right side) will be lost. Even though the histogram peak of a low key image such as the night sky is on the left side of the histogram where dark tones predominate, it is useful to have the brightest elements (right tail of the histogram), spread over most of the histogram’s right side. In this way the exposure uses the full spectrum (dynamic range) of the sensor’s 12-14 bit RAW data. With a bit of work in Photoshop/Lightroom, appropriate brightness values and contrast can be applied to all areas of the image. 47. 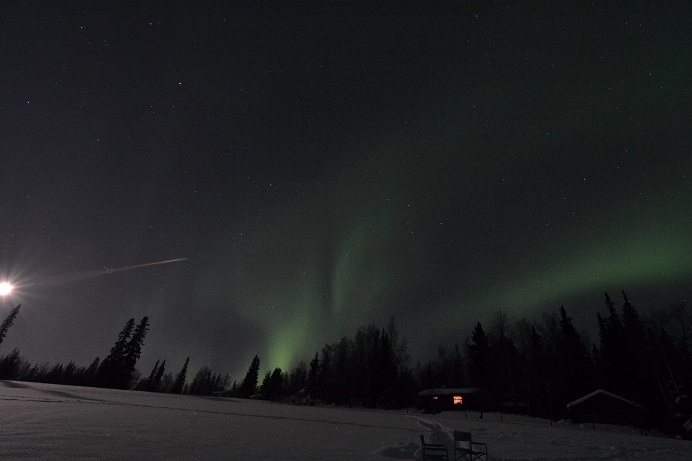 Fast moving aurora can best be captured with fast shutter speeds from 1 to 10 seconds. 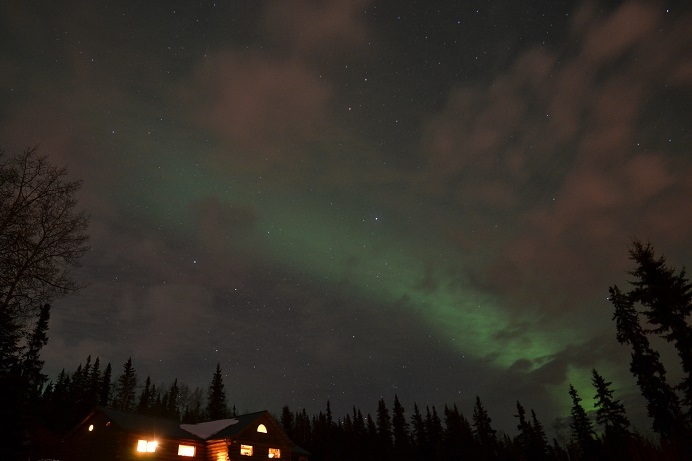 Shutter speeds longer than 30 seconds will generally blur the Aurora. 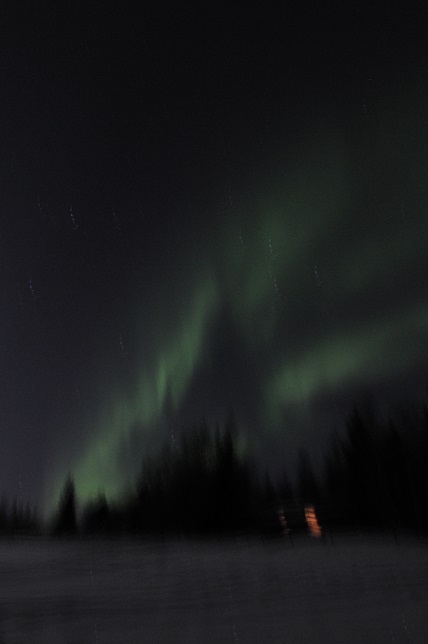 Higher shutter speeds are more apt to show vertical lines in aurora curtains. 48. ISO speeds between 200 and 3200 are normal for aurora shooting. If using high ISO numbers noise can be removed with software. Do not use an ISO that is too low or the aurora may not show up. 49. Time lapse movies work best with a wide angle or fish-eye lens. Most cameras have an interval shooting feature. A fast shutter speed is needed–15 seconds is the max. Then use ISO 3200 or higher and decrease resolution to 1920×1080 or 1280×720. Make a movie at 6 to 30 fps. To make a movie that lasts 10 sec at 6 fps requires 60 stills. If the shutter speed is 10 seconds with a time between exposures of 2 seconds, you need 720 seconds or 12 minutes of photography. Similarly for a movie lasting 60 seconds at 20 fps you need 1200 stills or 4 hours of picture taking. Most batteries will have died by that time. 51. Though we recommend using only a red flashlight (above), it is hard to hold a flashlight, gloves, adjust the camera and shutter release. Photographers might offset this clumsy operation by placing the flashlight on a lanyard and wear it around your neck. It is one less thing to carry that could fall into the snow in the dark and become lost. 52. 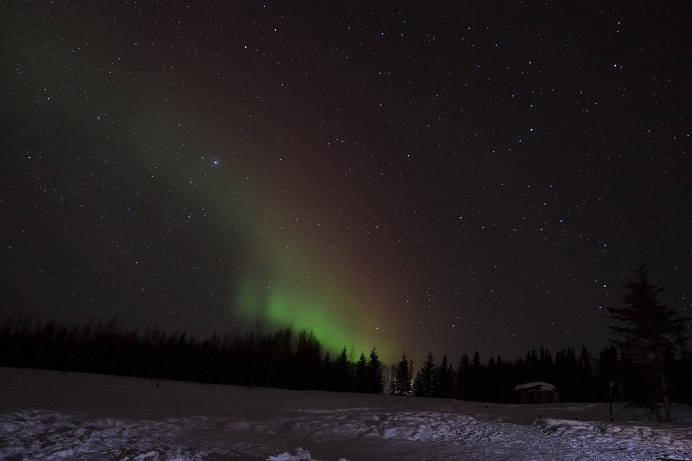 Before the aurora outing, practice using your camera with gloves on and also in the dark. This will give you an advance indication as to the type of gloves that might work the best or if you must use just exposed fingers to make camera adjustments. 53. Check your owner’s manual to see if your camera has an ISO sensitivity adjustments setting. This allows you to tell the camera to adjust the ISO if optimal exposure can’t be obtained at the level you set it at. You can set the maximum adjustment (e.g. limit to 3200 or 6400, etc.). You may wish to see if this setting can be of use for aurora photography. 54. If you are using a manual shutter release, you may find that it could jam as a result of the cold. To avoid having to manually depress the exposure button, some cameras may still permit the release to be used in a different way. A signal for a failed shutter release might be when the light that indicates buffering goes out, but the image does not appear on the back screen. In that case, pull out the shutter release and the image should appear. Be cautious since reinserting the release even without depressing the button could cause the shutter to be released anyway. 55. If you are spending hours outdoors on a subfreezing night, periodically check your camera lens for the presence of ice crystals. Should they appear, it would be advisable to go back indoors and blast heat on ‘high’ with a hair dryer carefully checking for dissipation of ice crystals. Sometimes it may not be possible to eliminate them if embedded below the lens surface. Once they are diminished sufficiently, however, you are then free to go back out and resume photography. 56. Shooting aurora near the Moon is not an issue! Do not fear this. However, be aware that you *may* get internal reflections if the Moon is in your field of view. MISTAKES: NOT PLEASED WITH YOUR AURORA PHOTOS? Obtain software such as Adobe Photoshop which will allow you to transform otherwise dull and lifeless images into more attractive ones. Image below is from P. Lobert. BAD AIM: You are trying to shoot the aurora but cannot aim properly so part of the aurora is cut off. OVER EXPOSURE: The above image is ‘blown out’ by over exposure. The one that follows is just slightly processed by Photoshop but is a first start at reducing the over exposure. 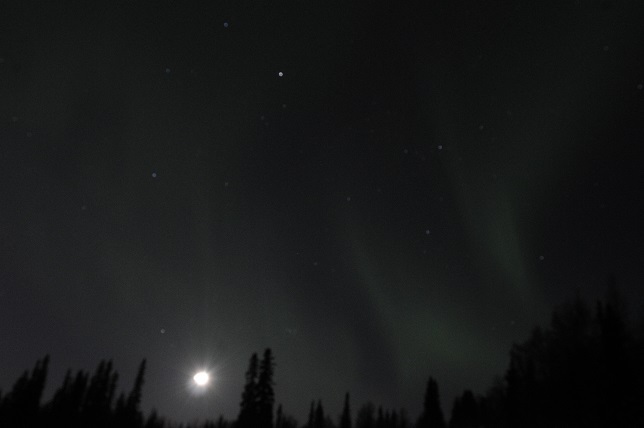 One thing to notice is that although the overall brightness of the aurora is reduced, so are the background stars. This web page is not intended to be a tutorial on processing, but only to direct you to moving in that direction to improving your images. BADLY SECURED TRIPOD AND UNDEREXPOSURE: Ensure your tripod is on a firm surface, especially if the ground is snow covered. Do not use a flimsy tripod. If you do, you might get results like the following. 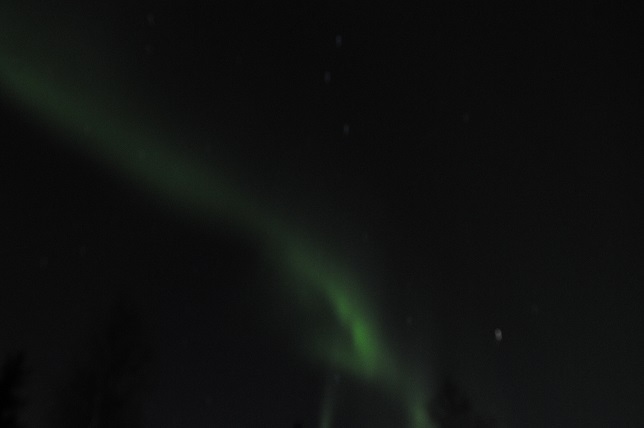 Also you can see that the aurora is clearly underexposed, so two problems manifest themselves here. 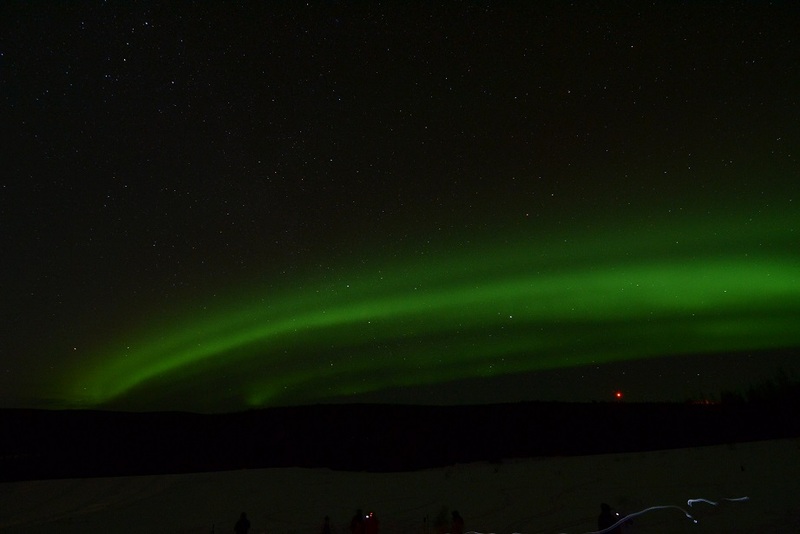 SMART PHONE: You can shoot aurora with a smart phone but we recommend it be mounted. 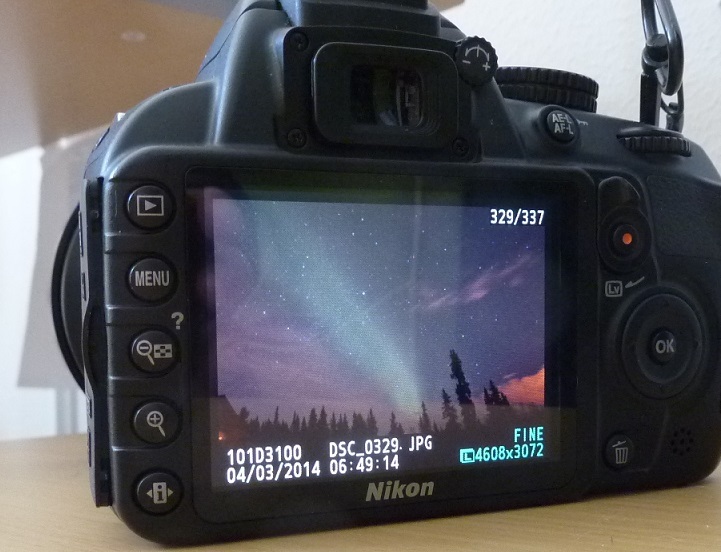 However, if held properly it can record an aurora image as in the following. MOON AT THE EDGE: Beware of placing the Moon at the edge of your photo or you might get a line from the Moon moving to one side. MOON IN THE CENTER: in the next image the author thought he had a good shot but if you look closely from the Moon at a 45 degree angle to the upper right you can see two slightly elongated faint images which are internal camera reflections. MOON OUTSIDE THE FIELD OF VIEW: Even with the lens a few degrees OUTSIDE your field of view it is possible to have impacts to your photos. See the faint white spot on center left and the rainbow in center right. OUT OF FOCUS: The most important subject for aurora photographers may be the perils of bad focusing and not recognizing it. As one grows older, what may appear to be good focus may not be. One useful aid is the zoom button that enables the photographer to examine his/her photos after they occur. You must use this feature if you have other than 20/20 vision or if you are working in an environment where you may have an unstable surface supporting your camera or footing. The photo above would have been great but if you look really close, all of the stars are out of focus, also making the aurora appear out of focus. In the above shot meant to capture the Moon and aurora, everything is out of focus. Taking one test shot and checking it for focus is all it takes; however, in the excitement of the moment the photographer kept on shooting. OUT OF FOCUS AND BUMPED: Two problems on the same photo. MULTIPLE MISTAKES ON THE SAME FRAME: Here is a case where out of focus, bad aim and lens flare occur in the same image. 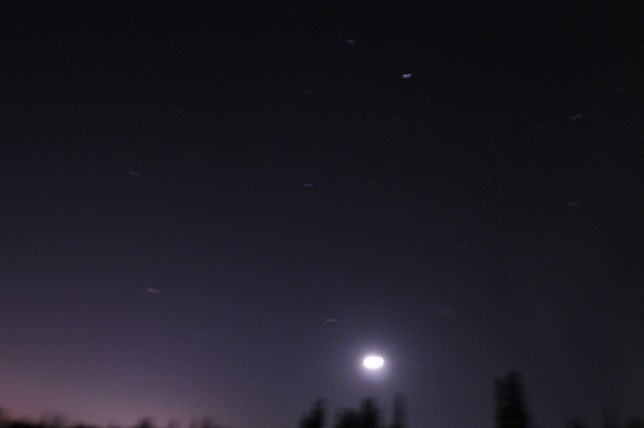 Here is a second case where you have too long an exposure causing stars to trail, bad aim, and out of focus. The photgrapher kept shooting unaware of all of this. Then we have this instance where the lens quality is poor as you move from center to edge, bad aim, and underexposure. DOUBLE IMAGES: there are a number of reasons why 2 star images will occur in the same frame. One is where you leave the shutter open for a long time, place something in front of the lens during part of the exposure such that a gap in the star image appears. That is not the case below but there are still two images of each star and the Moon is also impacted. A more likely cause might be failing to use a shutter release and taking the photo by pushing a button on the camera. 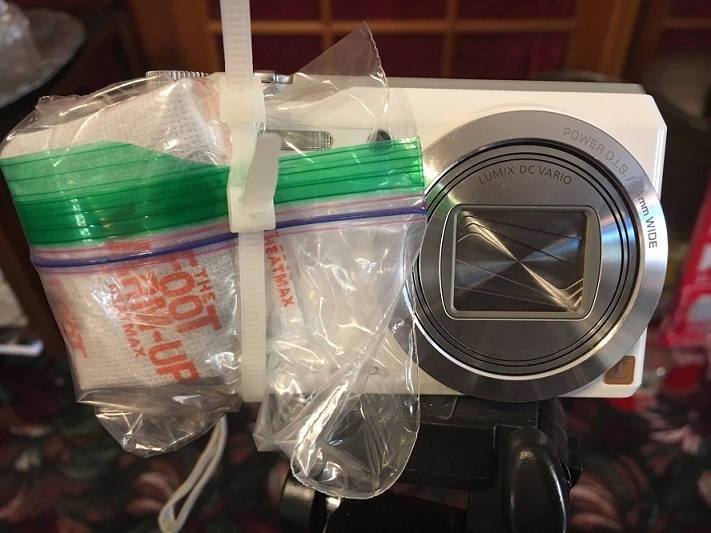 PROTECT YOUR CAMERA FROM COLD: If it is below freezing figure a clever way to protect your camera batter from seizing or dying by wrapping a toe/hand warmer around the battery compartment as in the image below. Don’t use tape. PEOPLE MOVING IN YOUR AURORA PHOTO: You don’t want this so be careful to ensure that you either tell people in front of your camera to briefly freeze in place or else change your field of view or position. 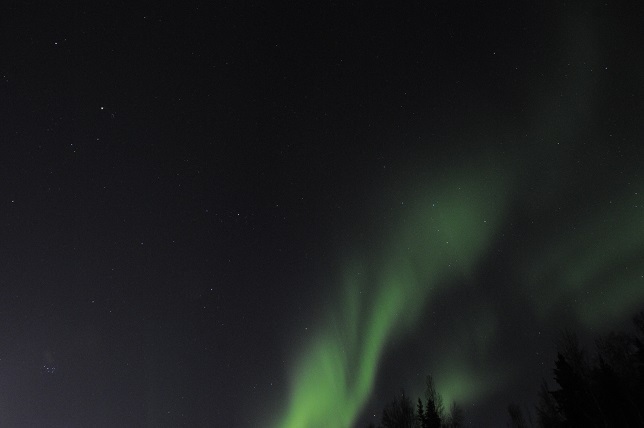 HAND HELD SHOT: A really bad idea is to attempt to photograph the aurora with a 35mm camera by hand-holding. ARTIFACTS: Sometimes you can spot an artifact of unknown origin in the photo such as this short line to the left of the bright star. BUMPED IMAGE OR SLIPPED TRIPOD: As an example, note the initial photo below. The photo above shows two nice aurora bands along with a red light on the horizon from a tower and star trails. However, if you look closer you can see the star trails are not curved (next image). This should be the first clue that something is wrong before proceeding. But lets go further into the sequence of captured photos for the next one. This is a nice shot showing broad diffuse aurora and stars that are in focus. Then, in the next shot, things go wrong again. What should have been a spectacular image is flagged by double star images of different brightness. How can this happen–going from a bad shot to a good shot and so on? Several possibilities emerge. The camera was on soft snow and each exposure was kicked off properly but possibly the photographer did not use a shutter release and depressed the shutter manually; the photographer may have moved during the exposure causing the snowy surface and tripod to shift; there was some wind and the camera was not firmly secured to the tripod. In the photo below you can see the small button on the back of a Nikon D3100 (located in different places on other cameras) where the photographer can use the zoom feature to examine the focus and quality of the image. This must be done from the first photo and repeated periodically to ensure that movement or out of focus conditions can be quickly corrected before it gets out of hand. Aurora can come and go and before long you are faced with waiting for another night. If the problem is not recognized the first night, the photographer must review his/her images the next day and check to see what changes need to be made to get ready for the following night’s opportunity: ISO, exposure, f/stop, camera tightness, tripod integrity, shutter release cable integrity. Zoom button (+) and unzoom (-) buttons are clearly seen on the left side. The initial image is displayed on the back screen. 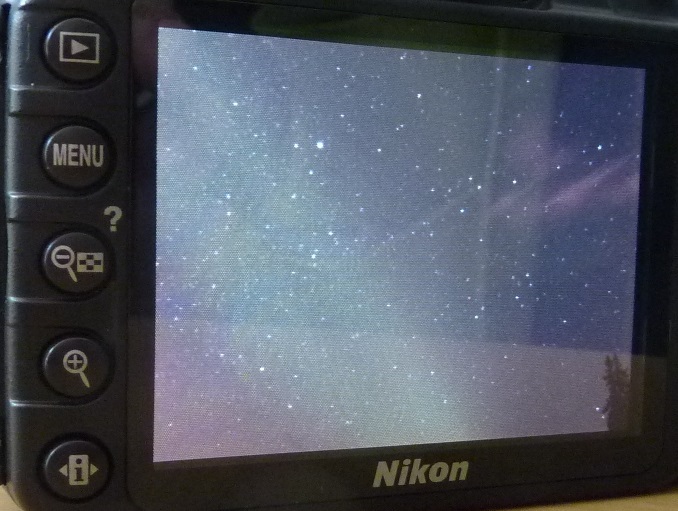 The zoom button is used and it shows the stars in clear focus. That is the signal things are going well. If you follow the above recommendations, we hope you will be able to improve or guarantee the best chance of bringing home wonderful aurora photos! Thanks to Paul Lobert, Byron Braswell, and Dee Holisky for their helpful review of my recommendations. Ring of Fire Expeditions (ROFE) is the longest consecutive astronomical tour organization in the United States. ROFE specializes in astro-tourism since 1970 with expeditions organized and led by Paul D. Maley of the NASA Johnson Space Center Astronomical Society and arranged by Future Travel in Houston, Texas USA. These include tours to observe such events as Halley’s Comet, the Leonid meteor shower, transit of Venus, spacecraft reentries, solar eclipses, grazing occultations, and occultations of stars by minor planets.